AM Insulation Solutions is a quality attic insulation company in London, providing a wide variety of attic upgrade services. 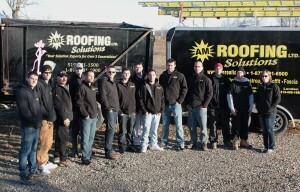 As a part of the AM Roofing Solutions Group of Companies, AM Insulation Solutions is held to the same standard of quality and customer satisfaction. Hiring only tradespeople with the expected level of integrity and experience, and providing those attic insulation professionals with constant and accredited training guarantees a job well done, every time. To prove this, AM Insulation Solutions offers the same 10yr workmanship warranty, as their parent company. Just as AM Roofing Solutions has become a leader in the roofing industry, this insulation company in London strives to be at the top of their specific industry as well. AM Insulation Solutions is WSIB, and Liability insured and has all the proper training and certifications. Whatever your attic needs to help it perform as expected, this quality attic insulation company in London can help. AM Insulation Solutions includes the use of thermal technology for every attic inspection they perform. This extremely useful technology helps to ensure that every air leak is discovered, and can be corrected. It is also a useful visual aid, in order to show every customer, the extent of their heat loss, and is also used in all inspections that are conducted, post attic insulation replacement, to compare the differences. AM Insulation Solutions has all of the proper equipment to remove all of your old, and dirty attic insulation cleanly and efficiently. Depending on the state of your existing attic insulation, this is generally a job that is best left to the attic insulation experts in London. If you are also having your current roofing system replaced, AM Insulation Solutions can remove your attic insulation at the same time, this cuts down on any additional disruption to your life. An insufficient amount of attic ventilation can cause serious and costly, issues in your attic space and on your roofing system in general. During the winter, an under ventilation can cause moisture to collect in your attic space, leading to mold and mildew development and the problem of ice damming on your roof. It can also significantly decrease your homes energy efficiency in the summer months. The certified and insured attic insulation experts at AM Insulation Solutions, can assist you with any of your attic ventilation needs. Having your attic inspected for any gaps, or holes in need of sealing is the best way to prevent animal infestations, and damage causing moisture from entering your attic space. Having your attic space thoroughly inspected and properly sealed can also help to keep your home functioning as efficiently as possible, when it comes to heating and cooling. Allow AM Insulation Solutions to provide a certified thermal inspection and seal all holes, before a significant issue can occur. AM Insulation Solutions is becoming a leader in the attic insulation industry, this is in part, due to the reputation of their parent company, as well as, their close relationship with the leading attic insulation manufacturer, Owens Corning. This insulation company in London, offers clean and efficient, blown in attic insulation for every attic insulation replacement. AM Insulation Solutions also offers an attic insulation top up program, for homes who may only need a slight increase in attic insulation to bring their attic space up to standard. AM Insulation Solutions provides quality attic insulation services to the city of London and all surrounding communities, and municipalities big or small, including Sarnia, Woodstock, Exeter, Stratford and Grand Bend.